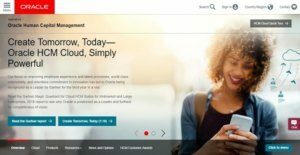 Oracle HCM Cloud Reviews: Overview, Pricing and Features. Oracle HCM Cloud is an all-in-one human resources management system created for medium-sized companies and large enterprises. Offering a comprehensive and highly configurable UI, this software consolidates multiple HR processes including recruitment, talent management, payroll, and work-life solutions to help you achieve workforce agility. It consists of multiple modules that can be used separately or combined, depending on the current needs of your business. The software offers a Global HR system that tackles all general HR components, a Talent Management module which handles the employee lifecycle, a Workforce Management module that can be used to manage labor costs, and an Analytics module to help you get insights on performance and productivity. In addition, it has supplementary systems for workforce rewards and work-life solutions to improve employee engagement. Trusted by hundreds of reputable organizations worldwide, this platform is designed with an AI-first approach to help you streamline your workflow and make smarter decisions with regards to recruitment and employee engagement. It can even be configured without needing IT services, allowing you to further increase your ROI while lowering the TCO of the software. One of the most unique aspects of Oracle HCM Cloud is that it consolidates all of your HR processes in one convenient interface. It offers a unified platform where you can engage employees, minimize compliance risks, manage recruitment, and even prepare payroll. With this, you no longer have to jump from platform to platform to perform your human resource management tasks. Finding good employees who will grow with your company is difficult. To help you make the process easier, Oracle HCM Cloud is equipped with a leading-edge recruitment module that can help you find top candidates and screen them thoroughly at the fastest possible time. The feature also leverages recruitment marketing and employee referral systems to help you get access to talent pools that match the job positions you are offering. Make sure your team is always in tiptop condition using Oracle HCM Cloud’s performance tracking feature. This allows you to monitor the progress and productivity of each employees so you can pinpoint key issues in your workflow and address them as quickly as possible. The feature is even equipped with frequent checkpoints for progress reviews as well as coaching schedules to help you organize your performance management efforts. No HR system is complete without talent management tools. Oracle HCM Cloud offers end-to-end human resource management tools that let you carry out all processes starting from onboarding to retirement. It allows you to effortlessly assess new hires, increase bench strength, identify succession plans, as well as create career development plans. This way, you can streamline your workflow and not worry about overlooking certain aspects of your process. Investing in your employees can go a long way. However, coming up with ways on how to drive performance and engagement in the workplace can be tricky. Using Oracle HCM Cloud’s career development tool, you can provide your staff members with personalized learning experiences. From creating targeted training curricula to facilitating collaborative learning seminars, this feature will surely help you find ways to reinforce your employees’ career development. Payroll preparation is a time-intensive task, especially for companies that rely on manual computations via spreadsheets. In fact, some businesses spend over 16 hours per month running payroll. Luckily, Oracle HCM Cloud has a built-in payroll management optimization feature that can accelerate the process and reduce payroll errors. This tool captures productive hours in real-time with high accuracy, so you no longer have to worry about manual time tracking. Moreover, it can automate the calculation of overtimes, premiums, and differentials. If you are considering Oracle HCM Cloud it could also be beneficial to examine other subcategories of Best HR Software gathered in our base of B2B software reviews. Every enterprise has its own characteristics, and can call for a specific HR Software solution that will be designed for their company size, type of customers and staff and even specific industry they deal with. You should not count on locating an ideal app that will be suitable for each business no matter what their background is. It may be a good idea to read a few Oracle HCM Cloud reviews first and even then you should pay attention to what the software is intended to do for your business and your staff. Do you require a simple and straightforward solution with only basic functions? Will you really make use of the complex functionalities needed by pros and large enterprises? Are there any specific tools that are especially practical for the industry you work in? If you ask yourself these questions it will be much easier to get a reliable service that will match your budget. How Much Does Oracle HCM Cloud Cost? We realize that when you make a decision to buy HR Software it’s important not only to see how experts evaluate it in their reviews, but also to find out if the real people and companies that buy it are actually satisfied with the product. That’s why we’ve created our behavior-based Customer Satisfaction Algorithm™ that gathers customer reviews, comments and Oracle HCM Cloud reviews across a wide range of social media sites. The data is then presented in an easy to digest form showing how many people had positive and negative experience with Oracle HCM Cloud. With that information at hand you should be equipped to make an informed buying decision that you won’t regret. What are Oracle HCM Cloud pricing details? What integrations are available for Oracle HCM Cloud? If you need more information about Oracle HCM Cloud or you simply have a question let us know what you need and we’ll forward your request directly to the vendor.